The Java Library for Excel (Jxcell) is a high performance library of components for Java development environments to create, manipulate and print Excel workbooks and worksheets. The Java Library for Excel provides the tools needed to store, analyze, manipulate and present any data in Excel. 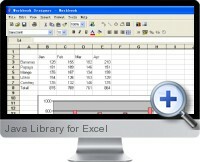 The library uses the Excel document format to support formulas, images, lines and charts. Open encrypted Excel files and save encrypted Excel files. Template support (create new workbooks using an existing workbook as a template). Various cell data types (numbers, strings, dates, floating point etc). Cell styles (alignment, indentation, rotation, borders, shading, protection, text wrapping and shrinking etc). Formatting options (font, color, content format, pattern, border line, border color, alignment). Conditional Formats (apply cell formats when the value of a cell or formula meets a predetermined set of conditions). Text orientation and applying different formatting to parts of a cell. Copy/Move/Delete - Cells can be copied, moved and deleted with the same behavior as in Excel. Rows and columns can be copied and moved as well. Copy/move between sheets is supported and entire sheets can be copied. Formula support (absolute and relative references, names, 3D cell references and more than 260 supported functions). Named ranges (names can be used and used to access ranges). Calculation engine (cells and whole worksheets can be calculated). Formulas with references to external workbooks are supported. Charts (supports all standard chart types like Column, Bar, Line, Pie, Scatter etc). Customize charts (stack chart, percentage pie, chart data labels, chart formats set etc). Pictures support (BMP, JPG, GIF, PNG, WMF). Hyperlink support (cell links, urls, email links, file links). Export data to Excel files, CSV text files and HTML files. Convert Excel to PDF file. Access all printing options (select paper size, set margins, set header and footer, including formatting codes. Define printing areas, set page breaks, preserve print area and summaries). View, create, modify, print spreadsheet in Swing GUI Component. Supports VBA and macros (Copied from master template).